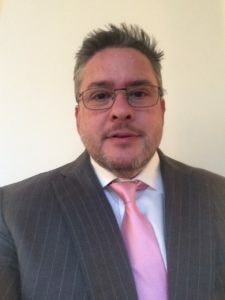 MarketModel Advisors | Michael J. Valletutti, founder of MarketModel Advisors, has quietly earned a reputation as one of the nation's most influential, effective, and mimicked profitable index futures traders. MarketModel Advisors, LLC celebrates 5 years of providing proprietary research related to stock market indices, primarily the "fair value" of the SP500. Clients of MarketModel include Hedge Funds, Independent Market Professionals, and Wealth Managers. MarketModel Advisors also applies this research as a Commodity Pool Operator (CPO), managing a hedge fund since Dec 2015. MarketModel is founded by Mike Valletutti, CTA. Following the 1987 market crash he began developing methods for determining market valuation and trading strategies while studying statistics & probabilities, time series analysis, probability modeling, and statistical experiments at Georgia Tech. "What's the market worth?" Probably the most asked question, with many different opinions. Traditional Technical Analysis methods use price to determine price. 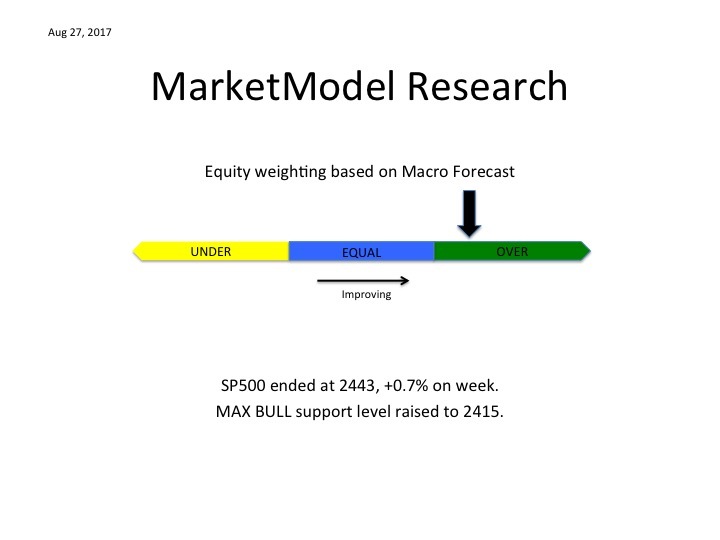 MarketModel uses macroeconomic inputs to help determine a value for the stock market. Long-only wealth managers are able to make finer portfolio adjustments to their equity allocations during periods of market under or over valuations. Michael is registered as an active CTA and MarketModel Advisors LLC is registered as a CPO with the National Futures Association (NFA). The goal of active management is deliver better risk-adjusted returns than passive investing. The fundamental theory is that macroeconomic conditions lead stock market prices. If true, producing accurate, forward-looking economic forecasts (i.e. ATL Fed GDPNow) could provide clues to the future direction of the major stock indices (i.e. SP500). Often times, stock market prices are controlled by sentiment - greed and fear - which can lead to disconnects between price's "fair value". The model wants to buy the market when price is a discount to fair value, and short the market when price is a premium to fair value. The model isn't a crystal ball. Trade signals are based on Probabilities and Statistical methods, producing different trades with differing probability of success. Overall, model is right 2 out of 3 trades. More recently, research has been focused on limiting maximum exposure to the stock market. Today's markets are faster than ever, and high velocity of price movements is normal. With high velocity markets, scaling strategies developed by the models help spread out the investment into a long or short position. The model is not a HFT or intraday scalping algorithm, only changing the position about 2-3x a month, on average. The model is a pure directional bet on whether the SP500 will rise or fall, which during bull or bear markets, is able to profit from not only the major trend but also sell into the minor counter-trends. The result is a system designed to beat the SP index by profiting when the market loses during pullbacks. Once you have a system that produces an estimated fair value for the stock market, the next step is to decide which strategy fits the desired results. The model produces not only a prediction of direction of SP500, but also a probability strength of signal. One could create a hedged strategy where Shorting SP is utilized, which makes profits possible during a market decline. This hedge fund approach is best combined with another long-only portfolio. This Long/Short 100% version of the model is employed by the firm's commodity pool. Another option is to supplement the long-only strategy, using the model to change equity weighting allocations, making better timed buys and sells. Scaling between 0% long to 200% long at MAX BULL. Selling means taking profits, not shorting the market. 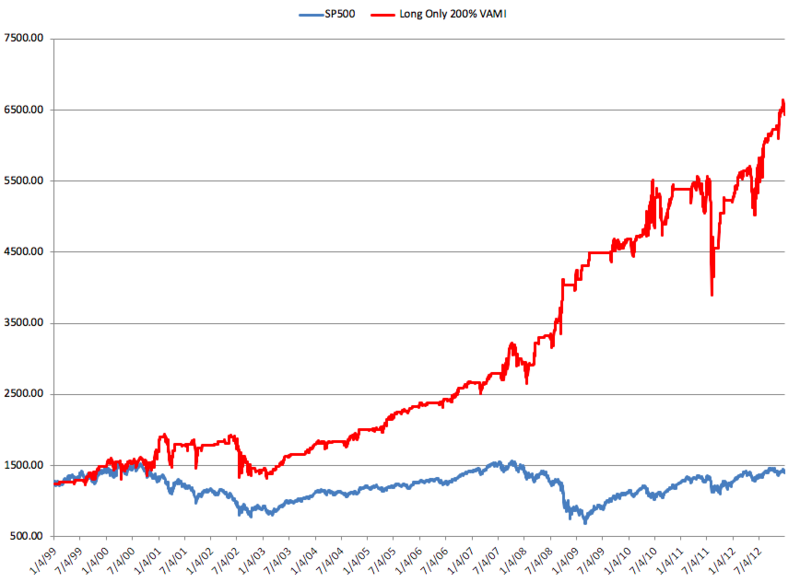 The graph shows 1999-2012 backtesting results of the Long-Only 200% model theory as compared to passive index investing in the SP500. First 12 month period, fund was above backtested average return of 8.6% net of fees. In December 2015, Macro Fair Value had started to roll over, and the fund was positioned correctly short ES futures. With only one failed hedge trade in March, the fund had strong monthly profits trading the long side, including up to Election night. Fund then faded the Trump Election rally to suffer its first multi-month drawdown. SP500 Price following the Election had spiked too far ahead of Macro Fair Value, and it took a quarter before Macro caught up to price. After this lag, Macro Fair Value led Price again for most of the rest of 2017. Since none of the short trades worked, the fund ended down -4.0%. For the last 12 months, the Fund returned back to form. After Macro models showed slowing in January and October, the fund was successful shorting the SP500 twice, while also trading the long side from March through September. As a result, the fund got back on track with ROR at +8.1%. A significant strategic advantage of the fund is identifying which SPX prices have the best odds of a defined short-term low during a market decline. The fund favors high cash balances, only scaling to full size when price falls to this MAX BULL support level. During market volatility, the fund can add short-term profits, sometimes significant. These MAX BULL signals occur during deep discounts between Macro Fair Value price and the actual SP500 price, and often coincide with extremely negative sentiment indicators. Normally these trades only last a few days - a panic selloff that reverses as price bounces back to an improving Macro Fair Value. These trades allow the fund to use its cash reserves for high risk opportunities, but limiting them to extreme, pre-defined price points. This scaling strategy allows the fund to have less than 50% exposure ("underweight SPX") to the market, on average. A simple example of a market model is comparing today's price to the historical average of price over, for example, the 50 past days. The rule would be to BUY when today's price is above the past average, and SELL if below. This rule could be easily backtested and other rules could be applied to produce win/loss ratio and profit/loss delta. Other rules could be applied and tested, but not so many that the rules only work for the test data. Known as curve-fitting, too many of today’s rules are created to fit just one set of past data, which will not work for new data. In simple terms, the rules were so stringent that they could only work once. The next method for a model is to forward test, which measures the results against actual forecasts. The goal is to gather real-time trades, capture their results, and compare against the benchmark backtest. Since 2013, the results were consistent with the historical testing, falling within test parameters including win/loss ratio, average drawdown, average ROR, as measured in 3 mo, 6 mo, 9 mo, and 12 mo periods. The forward test is key in determining if the backtest was uniquely unrepeatable or whether the methods applied will continue to work. By 2012, Michael’s confidence in his own MarketModel led him to establish a futures account and commit to trading the model signals, testing different position sizes and sharing trades on Twitter. Michael's trading diary moved to private subscription service in 2013-2014 via protected Twitter, where the nightly model signals were posted, along with trading results. 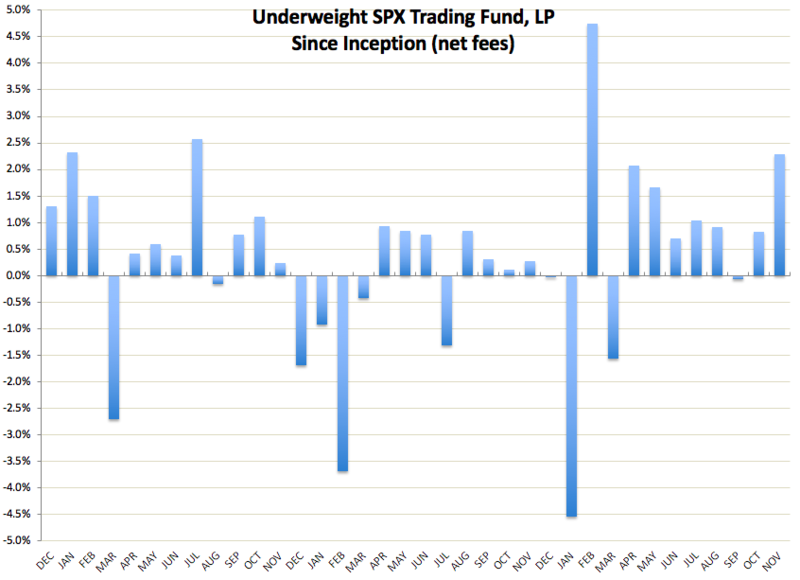 After 3 years of successful model performance in real-time, a group of members joined Michael in investing in Underweight SPX Trading Fund, LP to trade the model in a commodity pool. The model uses SP500 futures instead of the SPX cash because of the use of leverage provided by futures. Use of leverage is typically associated with high risk, however in our case, we are simply choosing to not to tie up $1M is cash buying and selling shares of the SPX. Leverage allows for the scaling from underweight SP500 to up to 1x leveraged (100% long or short). The model's use of futures allows for scaling into very large account balances. For example, a $1B account could invest alongside the model within the SP futures market easily within the avg volume and open interest of today's market. The investment decisions are almost entirely systematic, based on the model's signals. Wealth Managers and Investment Professionals are expected to have proprietary research that gives their client investments an edge over passive indexing. Most already have Technical Analysis and Sentiment indicators, but few have the complete view that is provided by Macro analysis. TRADING FUTURES WITH LEVERAGED NOTIONAL FUNDS USING THE MARKETMODEL ADVISORS TRADING MODEL INVOLVES SUBSTANTIAL RISK OF LOSS AND IS NOT SUITABLE FOR ALL INVESTORS. THE RISK OF LOSS IN TRADING COMMODITY INTERESTS CAN BE SUBSTANTIAL. YOU SHOULD THEREFORE CAREFULLY CONSIDER WHETHER SUCH TRADING IS SUITABLE FOR YOU IN LIGHT OF YOUR FINANCIAL CONDITION. THE HIGH DEGREE OF LEVERAGE THAT IS OFTEN OBTAINABLE IN COMMODITY INTEREST TRADING CAN WORK AGAINST YOU AS WELL AS FOR YOU. THE USE OF LEVERAGE CAN LEAD TO LARGE LOSSES AS WELL AS GAINS. PAST PERFORMANCE IS NOT NECESSARILY INDICATIVE OF FUTURE RESULTS.